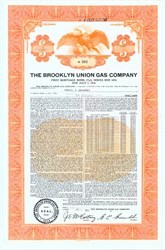 Pack of 100 Certificates - Brooklyn Union Gas Company (Now National Grid USA) - Price includes shipping costs to U.S.
Home > Certificate Quantities for Educators / Business Promotions > Pack of 100 Certificates - Brooklyn Union Gas Company (Now National Grid USA) - Price includes shipping costs to U.S. Beautifully engraved certificate from the Brooklyn Union Gas Company issued in the 1970's. This historic document has an ornate border around it with a vignette of an eagle. This item has the printed signatures of the Company’s President and Secretary. KeySpan Corporation, now part of National Grid USA, was the fifth largest distributor of natural gas in the United States. KeySpan was formed in 1998 as a result of the merger of Brooklyn Union Gas Company (founded 1895 by merging several smaller companies) and Long Island Lighting Company (LILCO), and briefly operated under the name MarketSpan following the merger. On November 8, 2000, KeySpan acquired Eastern Enterprises, Eastern's natural gas distribution subsidiaries including Boston Gas Company, Colonial Gas Company and Essex Gas Company; Eastern's unregulated businesses including ServicEdge Partners, the largest unregulated provider of residential HVAC equipment installation and services in Massachusetts; and EnergyNorth Natural Gas in New Hampshire. It also was the operator of the Long Island Power Authority's electrical grid. KeySpan had its headquarters in Brooklyn, New York, USA and employed 9,700 people. In February 2006, National Grid USA, a wholly owned subsidiary of National Grid plc of the United Kingdom, announced that it had agreed to buy KeySpan for $7.3bn (£4.1bn) in cash, the deal being subject to regulatory approval and endorsement by the shareholders of the two companies. In 2007 the National Grid plc announced the acquisition of KeySpan Corporation.